During the summer months, we get a natural sun-kissed glow. But we still need to take time to exfoliate, hydrate and protect our skin from sun damage--especially our faces. So Philips Pure Radiance Facial Cleansing System (the only cleansing system in the world that has a unique Sonic Technology with Advanced Dual Motion) enlisted celebrity aesthetician Joanna Vargas to give us her tried-and-true tips for flawless skin this summer and year-round. Everything She Wants was gifted a Philips Pure Radiance Cleansing System to try out and we love how gentle and lightweight it is (move over Clarisonic Mia); and we've been a client of Joanna's for several years, and always leave her tony Manhattan salon rejuvenated and refreshed. 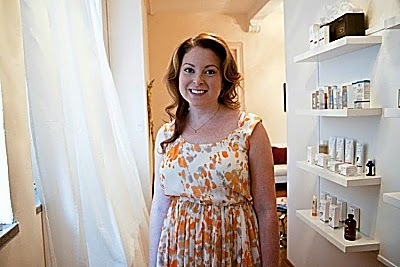 Joanna's tips for sumer vacation-ready skin. Sleep in an enzyme mask overnight. It will gently break down protein in dead skin cells and lightly exfoliate the skin. Enzyme masks are also known to improve circulation, tone, texture, and smoothness of the skin. It’s basically an overnight miracle worker! I also recommend using a fruit acid peel. They become truly detoxifying when you increase the skin’s circulation. Give yourself a facial massage while it’s on the face or use a peel that also contains paprika to get the blood flowing. Whether you’re traveling for vacation or to an upcoming event, flying on an airplane is really rough on the skin. I tell my celebrity clients who travel all over the world to spritz a rosewater spray mid-flight to re-hydrate the skin and exfoliate once they land. Headed to a fabulous island for some rest and relaxation? Don’t forget to dry brush your skin! It is my favorite old-fashioned yet effective tool to fight cellulite. If you want to have a perfect, beach ready figure you need to dry brush every day right before the shower. It increases collagen production, elasticity, and circulation immediately. Sunscreen is a must for so many reasons- elasticity, lines and unwanted pigment. I love when my clients use mineral sunscreen powders throughout the day- these products are great because they can be reapplied and never clog your pores. In fact, many of them contain zinc which helps keep control of your oil production. We all love that post-vacation glow, but the sun damage isn’t worth it! Use a product like Philips PureRadiance to fool your friends. The facial cleansing system stimulates blood flow improving microcirculation, resulting in radiant skin. As an added bonus, it’s sold with a travel pouch so you can take it wherever you go. Philips PureRadiance, a miraculous new skin cleansing system./Photo courtesy of Philips. Joanna's tips for how to get an everyday glow. First things first – you must wash your face every night, no matter what. I tell all of my clients this is the most important step in their skin care routine. Most of us wear makeup during the day, so it’s so important to remove it before bed. I like the Philips PureRadiance Facial Cleansing System because it’s as gentle as hand cleansing, yet 10X more effective at removing makeup. Nighttime is the body’s time to repair and restore. Once I’ve washed off my makeup, I like to slather on a serum that contains an antioxidant like argan oil and olive oil, which reduces inflammation and reverses sun damage. You’re covered for your evening skin care routine, but what about during the day? The lymphatic system delivers all the nutrients needed for healthy skin so I suggest applying a serum that contains magnesium, potassium and zinc before applying makeup. It will stimulate the lymphatic system and boost circulation. I also encourage my clients to give themselves a light, two minute lymphatic facial massage every day to help the body get rid of waste and circulate the important nutrients your skin needs to look healthy and glowing. Now that you have your daily routine locked in, you’ll need to incorporate my secret weapon for great skin – exfoliation! 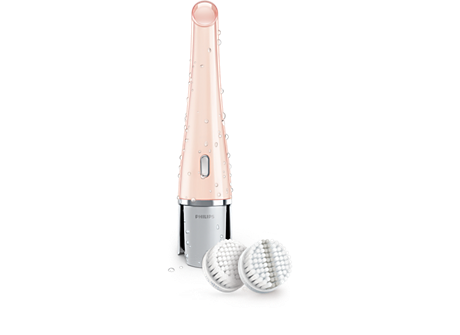 I recommend using the Philips PureRadiance Facial Cleansing System with the Exfoliation brush weekly to make the skin look fresh and radiant. I also like using a scrub/acid combination to completely resurface the skin while sloughing off the dead skin cells. Don’t forget about other ways you can help your skin that may not be obvious. For example, drinking an all-greens juice every day will help to hydrate the skin from the inside out, while oxygenating and stimulating the lymphatic system. Stick to a daily dose and you’ll see a difference in your skin in a few short days.